Now Terry, are you sure it’s not the whales doing that? I dove yesterday in the middle of the bay at Wainiha. This dive site is about half way in between Hanalei and Tunnels (BELOW THE RADARS) and is rarely visited by humans. Wainiha means “wild waters” and this 40 foot tall underwater cliff has lots of big surf and wild currents. The cliff is fully covered in giant mound corals up until now appeared very healthy. It has over 90% coral coverage with a lot of fish. I call the site “the aquarium” as it is so beautiful and I have video of these corals every two months over the past five years. I have supplied you with lots of video from Wainiha for your coral disease study and ____ from NOAA surveyed this site with me about 2 years ago. The reef was one of the last reefs to break out with the black band coral disease on the rice corals. What I saw yesterday was just stunning! Their were hundreds of corals littering the sea floor that were knocked off the cliff during the RIMPAC war games. I have before and after footage to show this. Some of these corals weigh Over 100 pounds and are upside down on top of other live corals! Looks as if a bull dozer came through and moved down part of the cliff. Other corals were broken up on the reef and about 40% of the giant old growth mound corals are dissolving and turning into mud. There still are about a dozen large mound corals that look OK but you can see the algae slowly eating away at them also and I suspect that they will too die soon. It is my educated belief after doing over 1,000 dives along the north shore of Kauai and watching these reefs crumble that the Military electronic war games are slowly weakening the reefs allowing disease and algae to take over. These weakened corals were easily blasted off the reef during the high intensity sonar used right off shore during RIMPAC. I have over 500 hours of video of the north shore reefs before RIMPAC and I now have about 30 hours of video after RIMPAC showing the damage at a number of locations from Anini Beach all the way down to the Na Pali coastline. I know I do not have a PHD in marine biology by I do have 2 college degrees (biology and geology) with 60,000 hours in the sea studying reefs and I have never seen anything like this in my 50 years of diving except in Belize and Moorea where I shot video of the reefs after a category 5 hurricane came through. What to you feel caused this type of destruction to our reefs here along the north shore of Kauai? Another observation I have had since RIMPAC began is that I have not seen one live dolphin anywhere up and down the north shore of Kauai and I am out everyday in the sea doing my reefs studies. I usually see hundreds of dolphin every week. 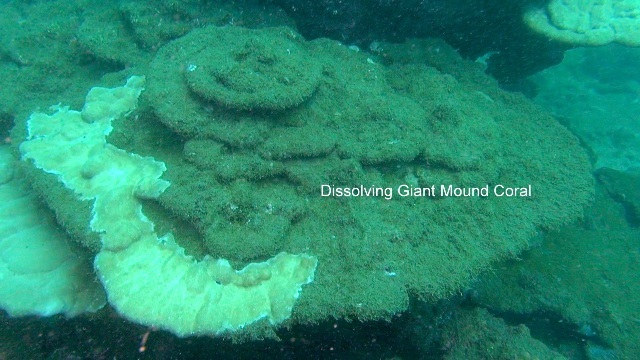 I attached pictures I took out of the video from yesterday that show the large live mound corals, broken corals and dissolving diseased corals. I have the entire video for your review if you would like.